Just like physical sticky notes we often use in our daily life, it would be very convenient to have sticky notes on Windows 10 desktop where we can jot down important things and reminders immediately without the need of opening any software. Here’s how to download and install desktop sticky notes for Windows 10. Sticky note used to be a built-in feature back in Windows Vista, Windows 7 and Windows 8. Ever since Microsoft decided to take down the sidebar gadget from Windows 8 due to security issue, desktop sticky note has since a feature difficult to come by. 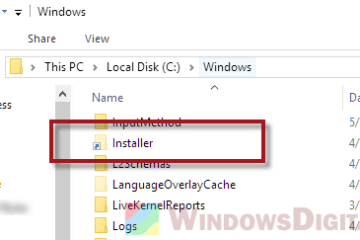 There are two methods which you can download and install sticky notes for Windows 10 for free. You can download desktop sticky notes for Windows 10 directly from Microsoft Store, or via a third party gadget software. Before Microsoft sticky notes app for Windows 10 is available, we used to have to go through a third party app called 8GadgetPack to install sticky notes for Windows 10. 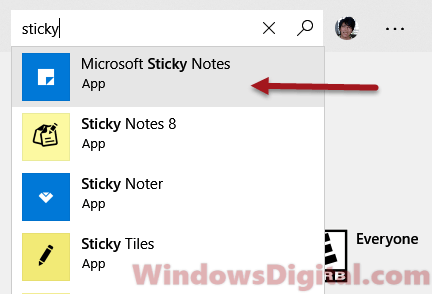 Now that Microsoft has its own official version of sticky notes app for Windows 10, we suggest you to switch over to this official version instead if you are using any of the older third party sticky notes desktop gadgets (for better secured notes). Microsoft Sticky Notes is a relatively new app which you can download for free from Microsoft Store. To download and install sticky notes for Windows 10, follow the steps below. Go to Windows Search / Start menu. Type Microsoft Store and open it. Search for sticky notes using the search bar provided. Select Microsoft Sticky Notes for Windows 10. Click Get the app to begin downloading and installing the Microsoft Sticky Notes for Windows 10. When the install is completed, click on the Launch button to start your first sticky notes. Optionally, you can click Pin to Start to pin sticky notes for Windows 10 to the taskbar for easy access. During first launch of Microsoft Sticky Notes app, you will be asked if you would like Windows to enable insights for the sticky notes app. 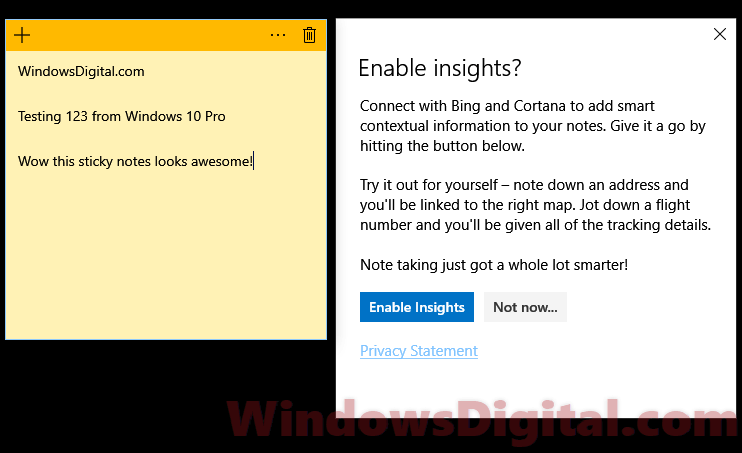 When enabled, the sticky notes app will connect with Bing and Cortana to add smart contextual information to your notes. For example, if you write down an address on the sticky notes for Windows 10, you’ll be linked to the right map. Jot down a flight number and you’ll be given all of the tracking details. This feature is just awesome and we recommend you to enable it. But, of course, if privacy is your concern, you can just select “Not now” when asked. You can freely change the sticky notes for Windows 10 to any color you prefer by clicking the menu on the sticky notes. You can also add or delete any number of sticky notes for Windows 10 by simply pressing the plus icon or the recycle bin icon. 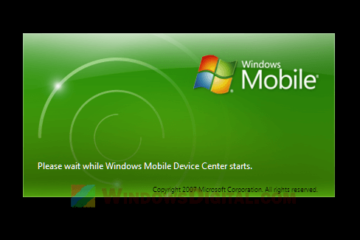 After Microsoft removed the sidebar feature from Windows 8, the only way to get sidebar gadgets or widgets is from 8GadgetPack. 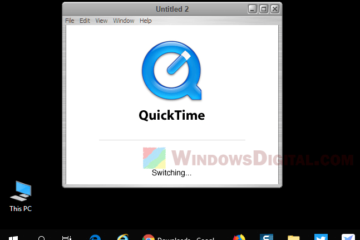 Since 8GadgetPack also miraculously work in Windows 10, we have been using it to download and use the legacy gadgets such as sticky notes, CPU meter, etc. Though downloading and installing sticky notes via 8GadgetPack is the old-fashioned way, if you need more customization to your sticky notes, you can use Sticky Notes Online which can be downloaded from 8GadgetPack. Go to 8gadgetpack.net. 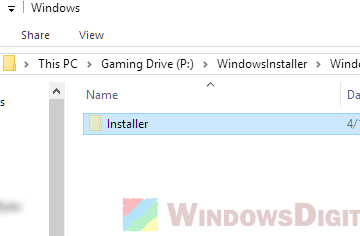 Download the 8gadgetpack installer to unlock the sidebar gadgets feature in Windows 10. In the same webpage, look for “sticky notes online” from the gadgets list. Download and install sticky notes for Windows 10. If you are using Sticky Notes online or any other sticky note gadget via 8gadgetpack, we strongly suggest not to enter any personal information such as your credit card info, account’s username password, etc. Especially for Sticky note online, it provides a synchronization service which sync your note to its server so that you won’t lose your note if you lose them on your desktop. But, that doesn’t mean it’s safe for you to enter any personal info. These gadgets are fan-made and not from any reputable organization or person. Update: Microsoft has released its own version of sticky notes for Windows 10 download on Microsoft Store. We recommend you to switch over to the official sticky notes app by Microsoft if you are still using any of the old sticky notes provided by third party person. Read above for more info. Description for sharing: 2 best free sticky notes for Windows 10 download if you want to jot down anything on your desktop. 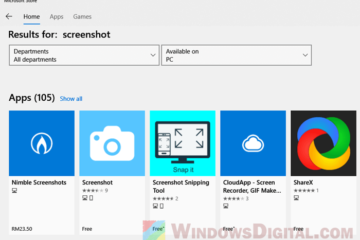 How to download and install desktop sticky notes for Windows 10 from Microsoft Store or via third party gadget software.